To relax, we have a total of five different saunas and two hay ovens in our “Masl Alpin” Wellness Oasis and “Masl Acqua”. The sauna-lovers among you will love our special infusions with selected essences. The different natural active ingredients penetrate deep into the skin and lungs and soothe body and soul. The relaxing scent of local mountain herbs and natural oils in our sauna world accompanies you everywhere. Regenerating mountain water refreshes you between each sauna session. 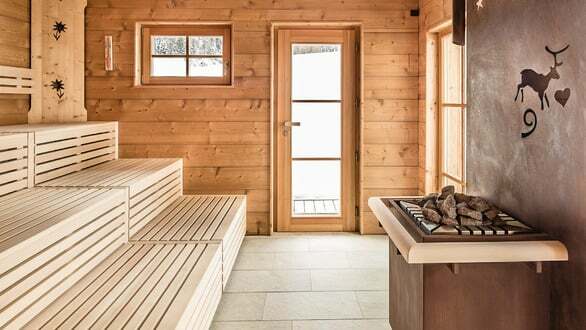 Be it in the snow or the green alpine meadow: our alpine log outdoor sauna with diving basin in the wellness park provides a special sauna experience. The outside is made of old wood, the inside of steamed spruce wood. The alpine log sauna is characterised by dry humidity (8-10%) and high temperatures (90-100°C) and strengthens the immune system. Furthermore, it stimulates circulation and the activity of the organs. Cosy sweating in a rustic flair: our Stube sauna makes it possible. The basic sauna elements of heating up and cooling down in very dry air are also present in the Tyrolean-style Stube sauna, which stimulates circulation and has a regenerating effect. Recommended after hiking or skiing! The gentle heat of the herbal bio steam room is created through the evaporation of herbal extracts and has a positive effect on the respiratory tract. The low temperatures (55-60°C) are ideal for sauna newbies and people suffering from poor circulation. You'll enjoy the sauna in a noble ceramic and natural stone ambience with high humidity and radiation heat, which are all especially tolerable. The organic herbs from South Tyrolean alpine pastures have a healthy effect on the immune system. Steam in a very gentle form. Sweating surrounded by precious mosaic stones. Steam baths prevent illnesses, support fat reduction, are ideal during convalescence, and detoxify in a healthy and careful way. The organic spruce sauna brings the medicinal atmosphere of the surrounding spruce forests into the sauna. The sauna is made of spruce wood and features gentle heat of 50-60°C with medium air humidity of about 50% for a gentle sauna experience.